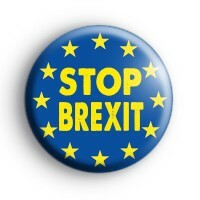 This blue & yellow European Flag Button Badge has the text Stop Brexit written in the centre in a yellow font. Our EU badges have been really popular since the European Union referendum in the UK & subsequent Brexit negotiations. The European flag symbolizes both the European Union and, more broadly, the identity and unity of Europe. So if you want to show your support for Britain remaining in the EU then our badges are a great way of doing that.